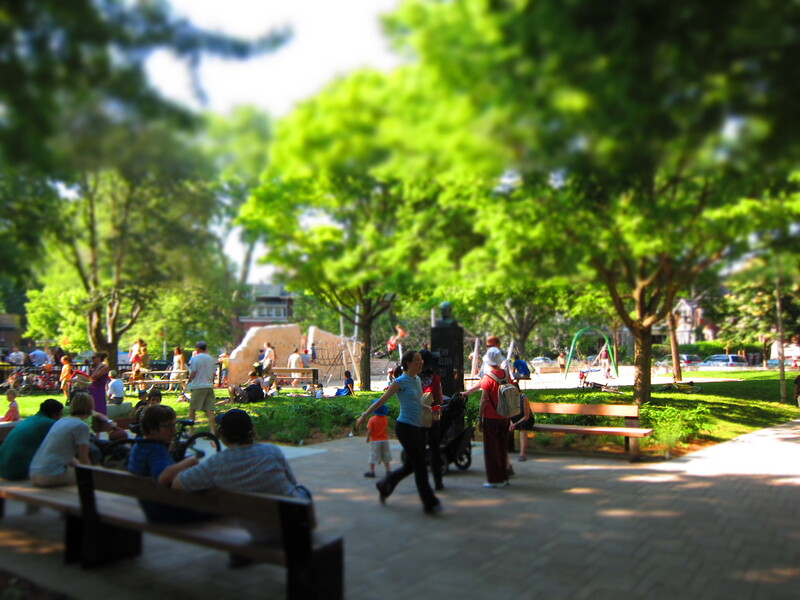 By West Annex News | Another week of happenings in and around the neighbourhood. The prospect of bike lanes on Bloor has made a remarkable comeback in the past week. 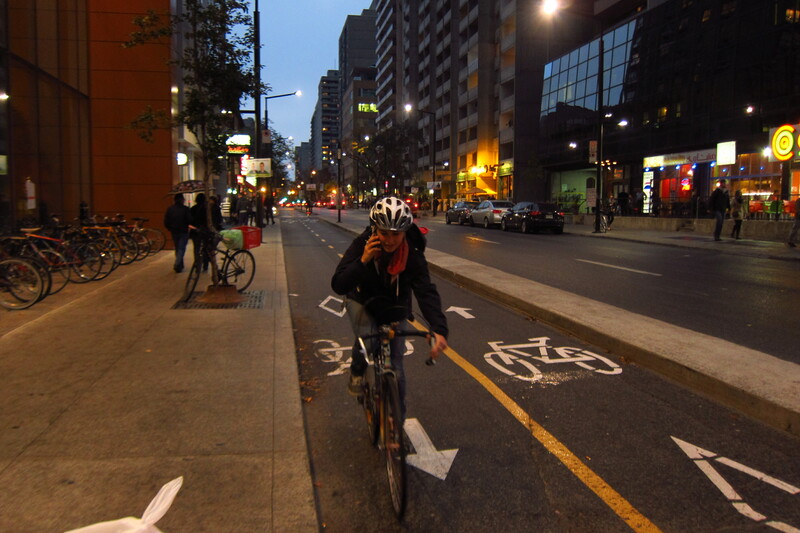 On October 21, 2013, the city Public Works Committee voted 5-1 in favour of reinstating an environmental study of the impact of bike lanes on Bloor. 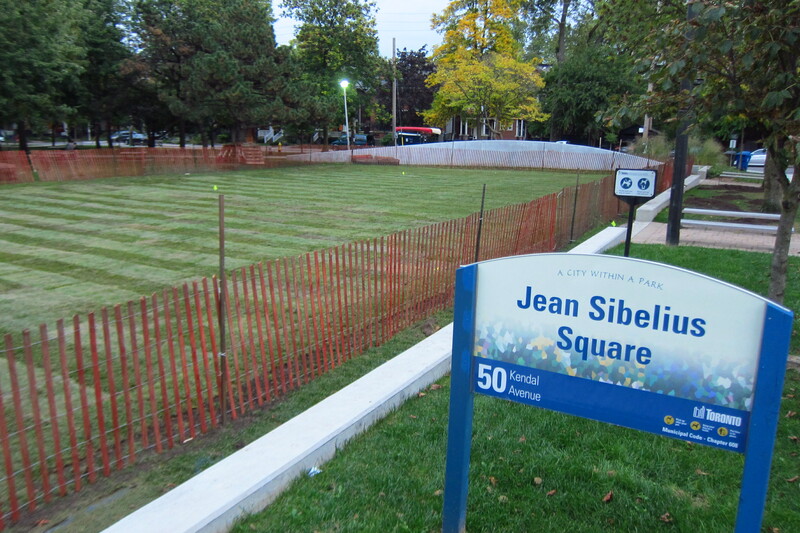 The study was scrapped in 2011 when Mayor Ford ripped out the Jarvis Street bike lanes. 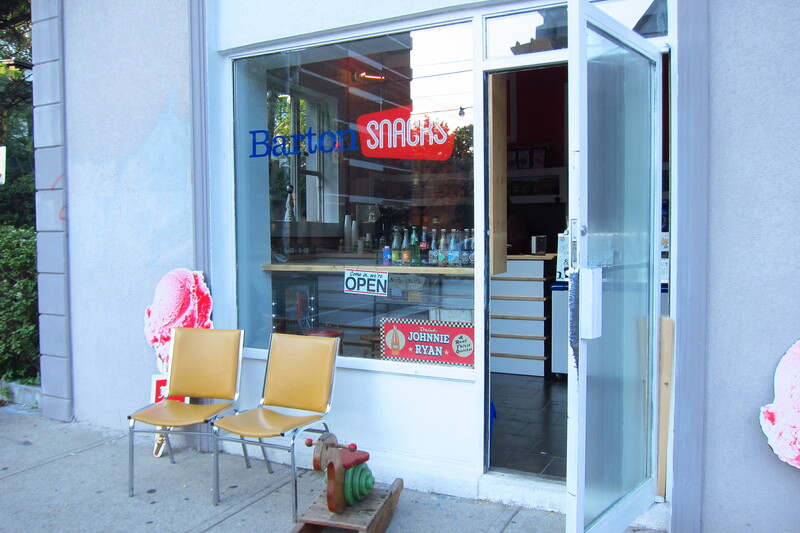 The Annex Residents’ Association and the Bloor-Annex BIA both supported the reopening of the study. 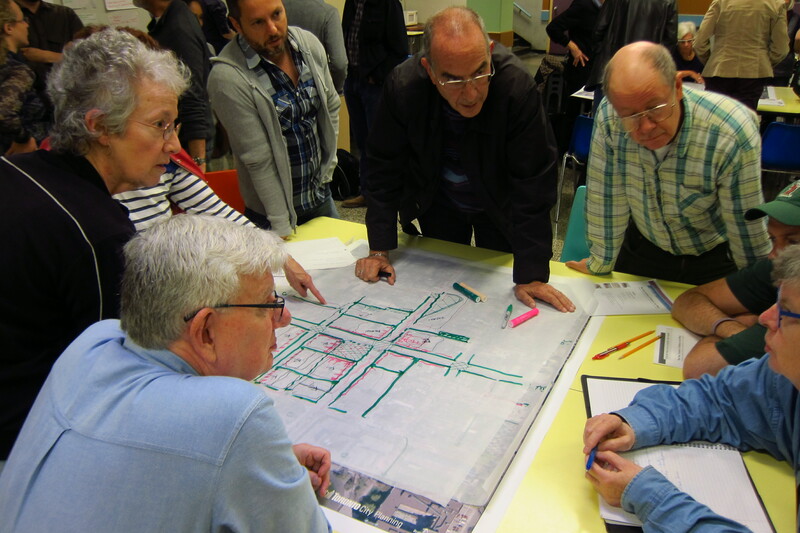 ARA director Albert Koehl told the committee that studies show ninety percent of people arriving on Bloor-Annex strip come on foot, by bike, or on transit, and that bike lanes on Bloor have strong public support. Ford ally Denzil Minnan-Wong was the only committee member to oppose the re-opening of the study. Councillor Adam Vaughan said “The world has changed, it is time for Councillor Minnan-Wong to wake up and smell the coffee.” [thestar.com, InsideToronto.com, & @reporterdonpeat/Don Peat on Twitter]. Speaking of Councillor Vaughan, his fall update is now out and includes a letter from Adam about the need to abolish Ontario Municipal Board. 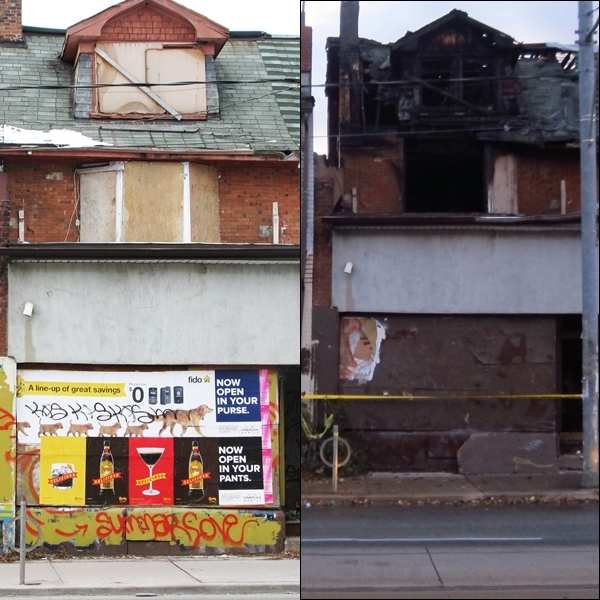 The Seaton Village Residents’ Association website has more information about the fire at 1000-1002 Bathurst Street, including a link to a 2004 Globe and Mail article about Spector’s Hardware and Plumbing Supply, already dusty and falling down nine years ago. 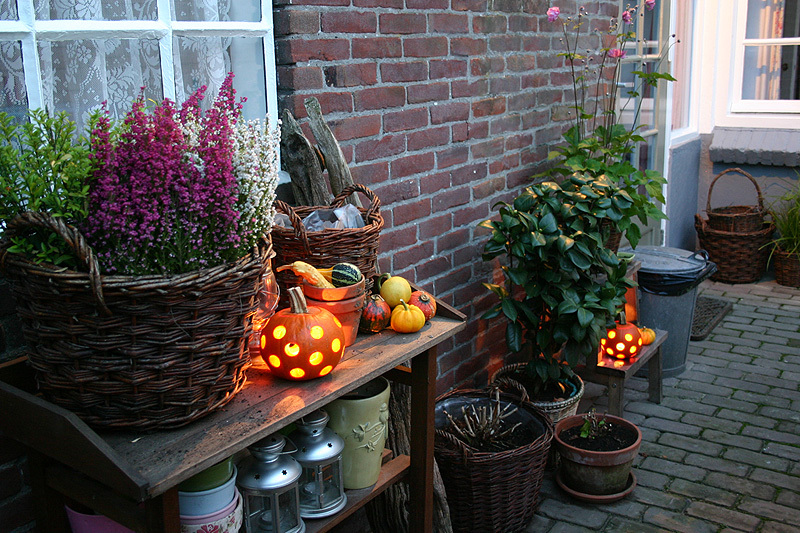 October 25 to 31, 2013: Halloweek at Bloor Hot Docs Cinema. Along with the traditional showing of the Rocky Horror Picture Show, the Bloor will be screening a number of scary movies from October 25, 2013 to October 31, 2013. The screening schedule can be found here. Saturday October 26, 5PM to 7PM: Halloween skating party at Bill Bolton Arena, 40 Rossmore Road in Vermont Square park. Admission is free and prizes will be given away. See Ring Around the City for other Halloween activities at the St. Alban’s Boys and Girls Club, including a October 25 showing of Tim Burton’s Frankenweenie. 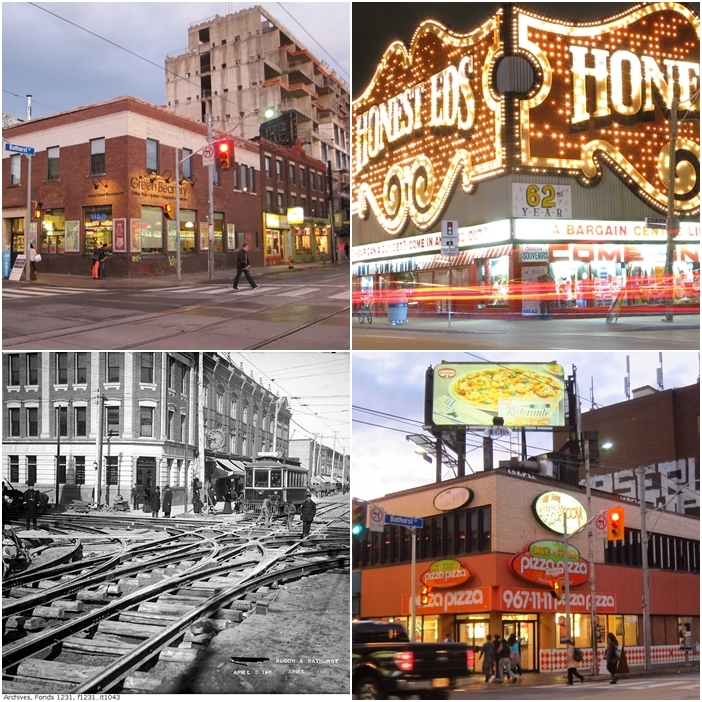 Saturday, October 26, 10AM to 5PM: Jane’s Walk is partnering with Riverside BIA to present nine new and free walks in the Riverside neighbourhood lead by local personalities. Walks include a fitness/dog walk, a culinary walk, and a medicinal plant and herb walk. Heard of Riverdale but not Riverside? It’s the Queen Street neighbourhood east from the Don Valley Parkway to Degrassi Street, right between Corktown and Leslieville. October 25 and 26: You should have stayed at home, a G20 drama finishes its run at the Aki Theatre, 585 Dundas Street East on October 26, 2013. While trying to return home from his first-ever protest as a law-abiding citizen at the “free speech” zone at Queen’s Park, Tommy Taylor was swept up in a mass arrest. This much-lauded drama tells his story of his arbitrary arrest, mistreatment by the police, and ultimate release without charges. October 24 to November 3: The International Festival of Authors at the Harbourfront Centre. The tribute to Alice Munro is on Sunday, November 2nd at 8PM. A day-by-day guide to the festival can be found here. 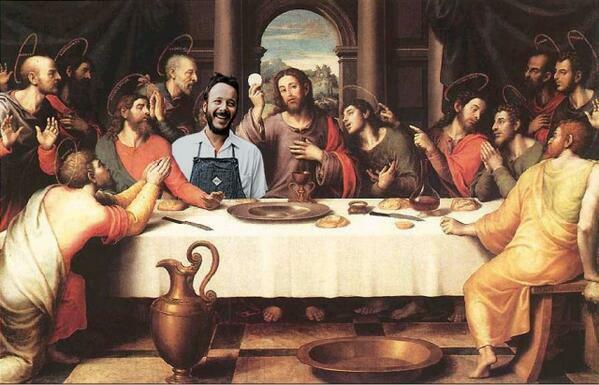 [Torontoist]. 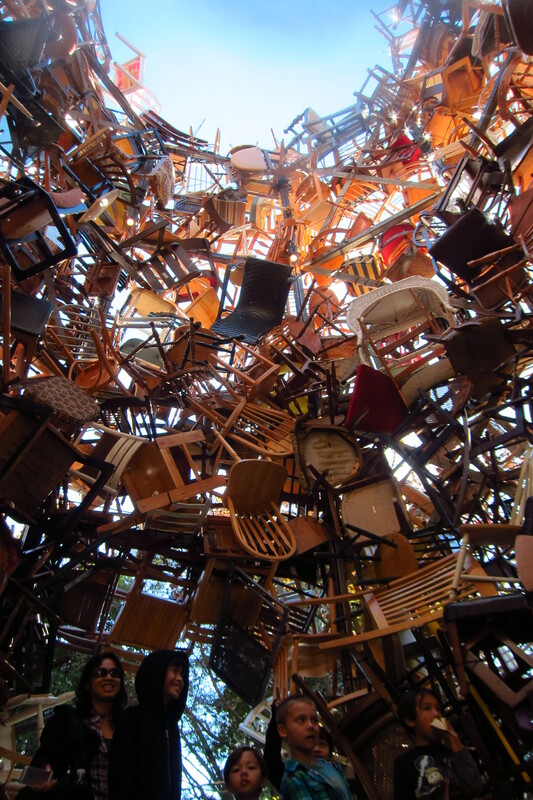 Have you seen the terrific Tedx Toronto 2013 conference opening video? 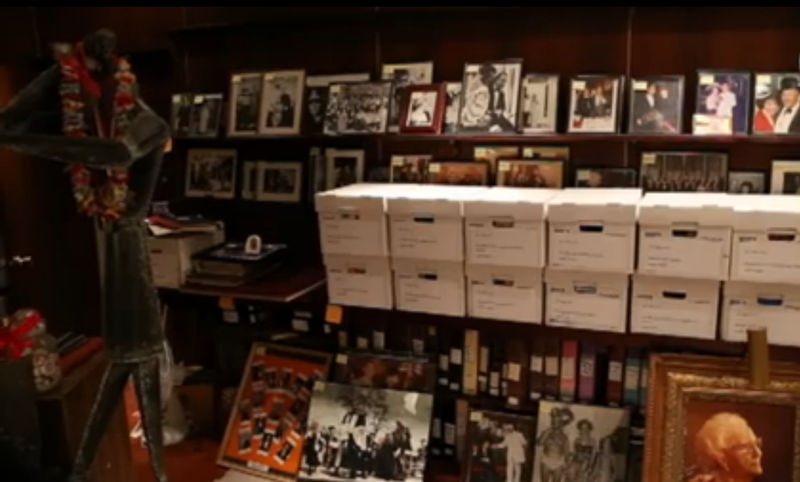 A great history of Toronto from age 0 to 220 — in just 2 minutes and 32 seconds. 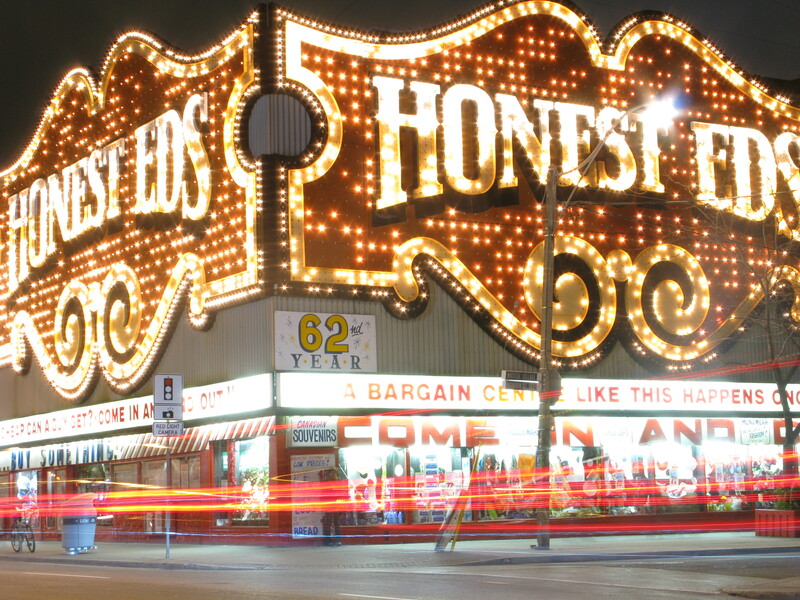 Honest Ed’s and Lee’s Palace both make brief appearances. Councilors Mike Layton and Adam Vaughan hosted a large gathering of community members from the Annex, Harbord Village, Seaton Village and Mirvish Village on Saturday, October 5, 2013 at Central Technical School to dream about the future of the four corners of Bathurst and Bloor. With the demolition of Honest Ed’s sadly a foregone conclusion, lots of exciting ideas emerged from the exercise: a piazza at the south-west corner of Bathurst and Bloor for cultural events like the Fringe and farmer’s market, a pedestrianized Markham Street Heritage Conservation District, and greened laneways to become the new transportation corridors for pedestrians and cyclists. 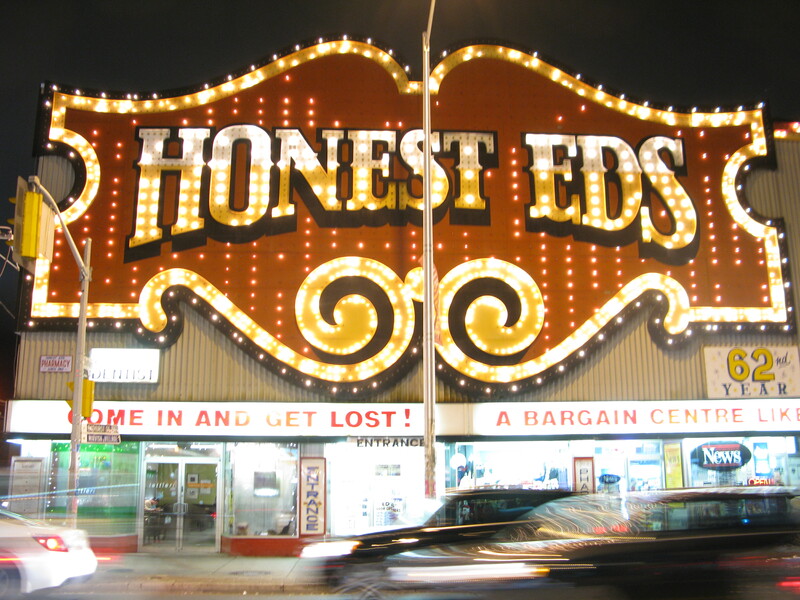 While the fate of Honest Ed’s sign is up in the air, another heritage sign may live to blink again. BlogTO reports that Ryerson University President Sheldon Levy says the Sam the Record Man’s sign could still return to Yonge and Gould. City Council rejected staff’s recommendation that Ryerson University be granted its request to be released from its agreement to preserve and re-hang the sign. Council referred the matter back to city staff for reconsideration. A two-alarm blaze tore through a derelict building at 1002 Bathurst Street just north of Olive on Monday, October 7, 2013, temporarily shutting down the Bathurst and St. Clair streetcars and other vehicular traffic. After dozens of firefighters responded and put the blaze out, a body was found on the second floor. The identity of the deceased, the cause of death and cause of the blaze have not yet been determined. The CBC reports that police are treating the fire as a suspicious event. 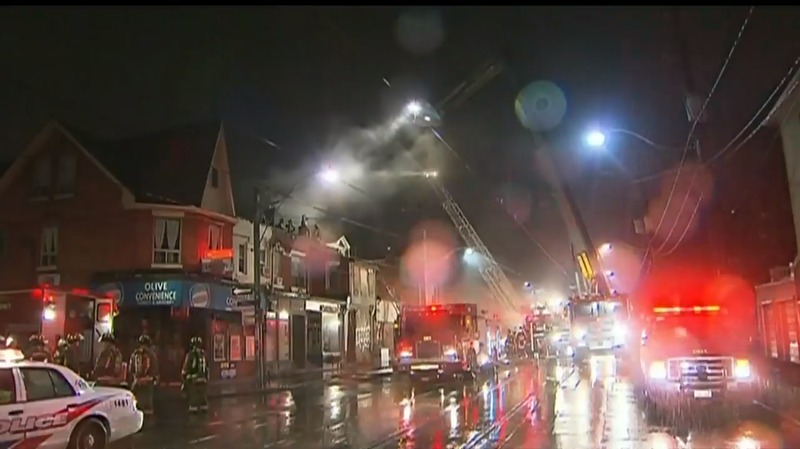 CTV has video of the fire here. The buildings at 1000 and 1002 Bathurst Street had been the subject of a legal battle between a developer and the city. 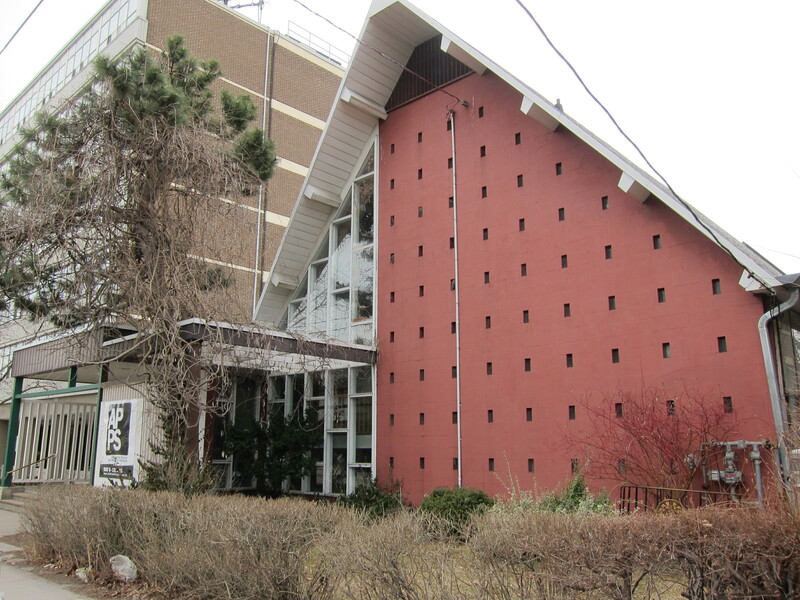 After their plan to develop a five-story apartment building on the site was rejected by the city, developer 2031430 Ontario Ltd. appealed to the OMB and in August of 2013 won a settlement with the city to build four meters taller than local zoning allowed, with exceptions also granted in setback, gross floor area coverage, and window set-backs. While average retail rents on Bloor Street hit a new high of $309US per square foot according to Colliers International’s 2013 retail report, this was only a 1.9% increase over 2012. Vancouver’s Robson Street saw a 33% increase to $200US per square foot. 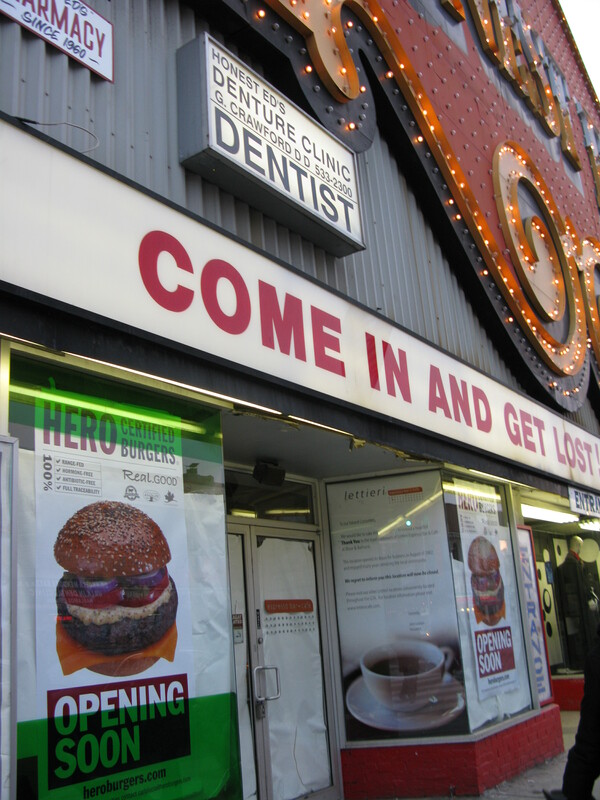 The Vancouver Sun reports that the influx of U.S. chains and luxury brands contributed to the dramatic lease rate increases across Western Canada. 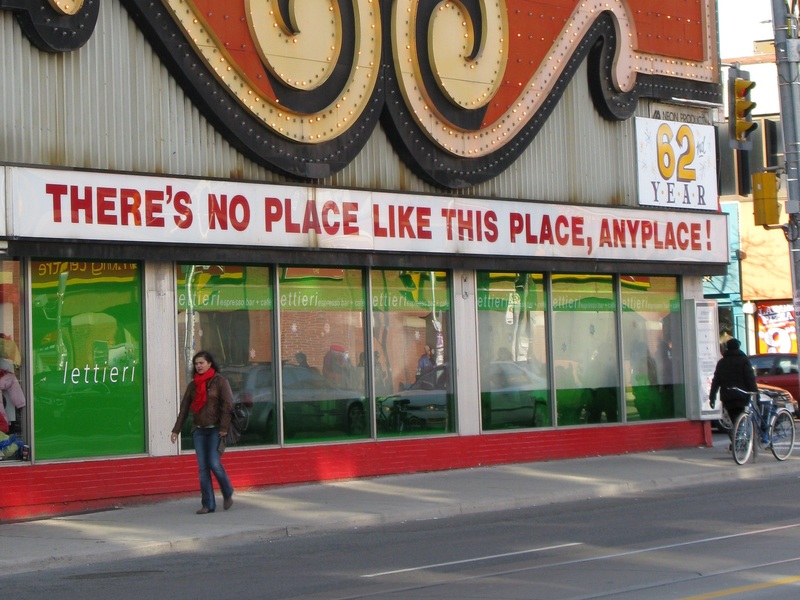 Bloor Street still leads Canada in retail rents, but does not make the world’s top ten. New York’s Fifth Avenue leads the world at $3,052 US per square foot. Condo financing crunch hits cooling Toronto market. The Star reports that condo buyer are scrambling to get financing to close the record number of condo units coming online. Many bought before financing rules were tightened up by Finance Minister Flaherty and now find at closing they no longer qualify. With some buyers forced to walk away from their deposits, a rapid cooling of the entire market is possible when a record 20,000 to 40,000 units are ready to close next year. The International Festival of Authors had already scheduled a tribute to Alice Munro on November 2nd when news broke yesterday that she was this year’s Nobel prize winner in literature. If you haven’t bought tickets yet, there still may be some available here. 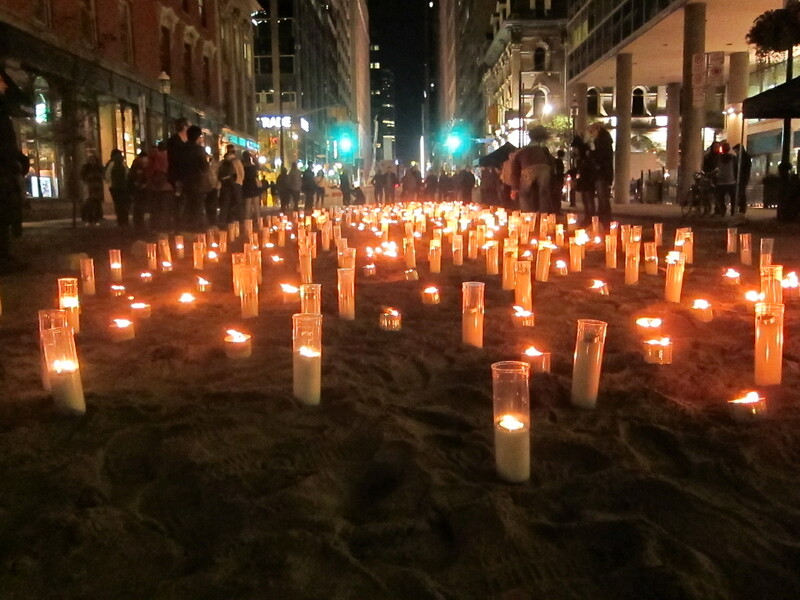 Après Nuit To October 14, 2013: If you missed Nuit Blanche last weekend or just want to have an encore visit, six Nuit Blanche projects are extending their run to October 14th including Ai Wei Wei’s Forever Bicycles at Nathan Phillips Square, and Tadashi Kawamata’s Garden Tower at Metropolitan United Church, two of only a few genuine hits from this year’s annual festival of visual art. 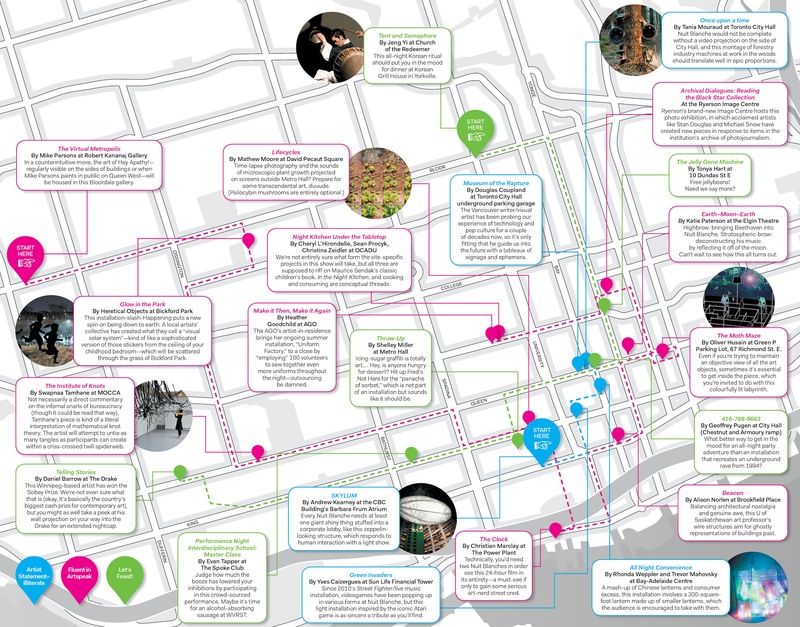 The Toronto 2013 Chocolate Festival starts October 12 and runs to November 3 in venues all around the city. Visit the website for coupons redeemable during the festival at participating chocolatiers, pastry shops and restaurants, and for tickets to the Chocolate Ball, Chocolate Dinner, and Chocolate High Tea and the King Edward Hotel. Heritage Toronto Awards Tuesday October 15, 2013 at Koerner Hall, Royal Conservatory of Music. The awards recognize individuals, community organizations, industry professionals and associations for exceptional contributions in heritage conservation. 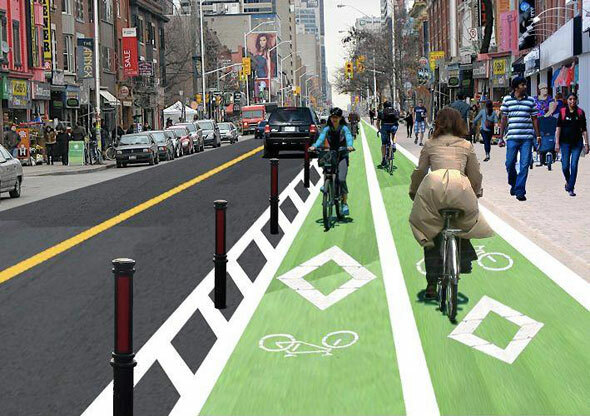 Bike lanes on Bloor might make a come-back. BlogTO and others are reporting that emails from residents and advocacy groups prompted a group of six city councillors to ask city staff to reopen a study into bike lanes on Bloor. Cycle Toronto has a petition with almost 1000 signatures, urging city council to support the initiative. Mayor Ford ended the study in 2011, at the same time he lead council to remove the Jarvis Street bike lanes. 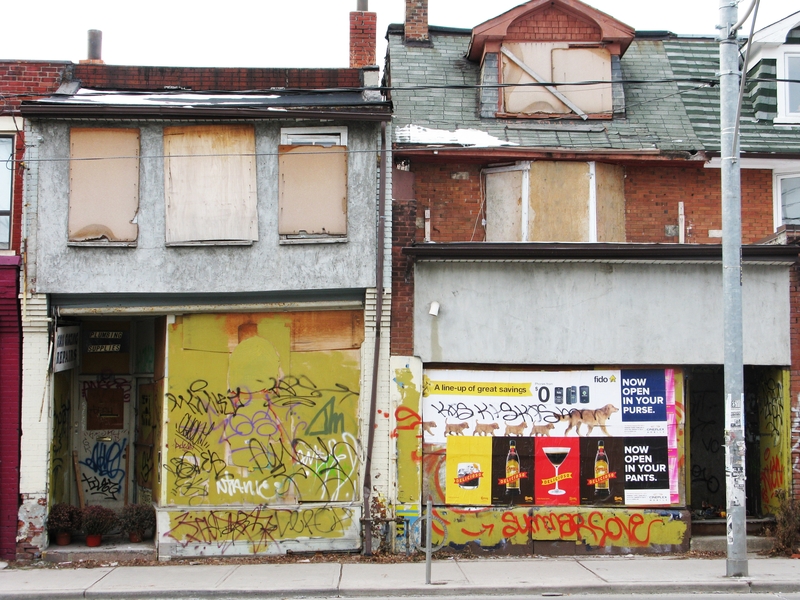 The interim control bylaw on Bathurst Street, meant to give both Kensington Market and Mirvish Village some breathing space from development pressures, is being challenged at the Ontario Municipal Board. RioCan’s application to put a Walmart in the former Kromer Radio site was turned down by the Committee of Adjustments in May. 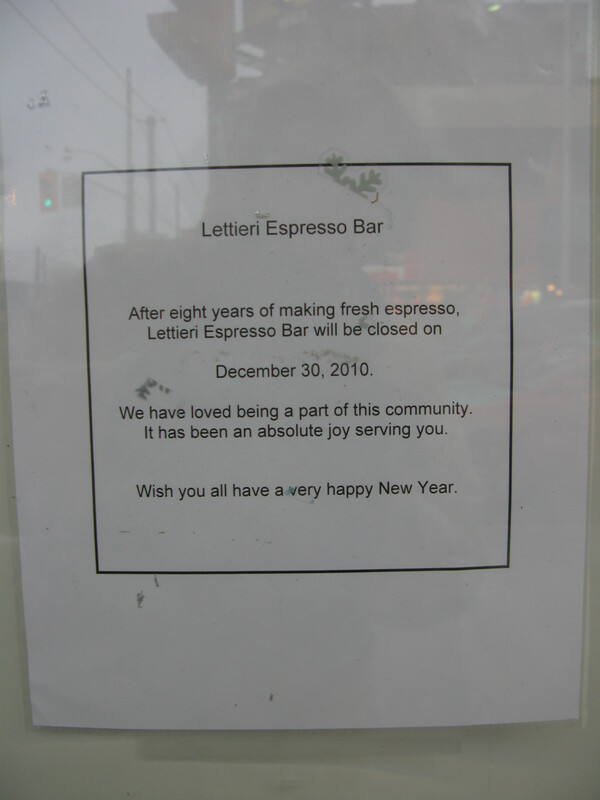 The bylaw was put in place in June. 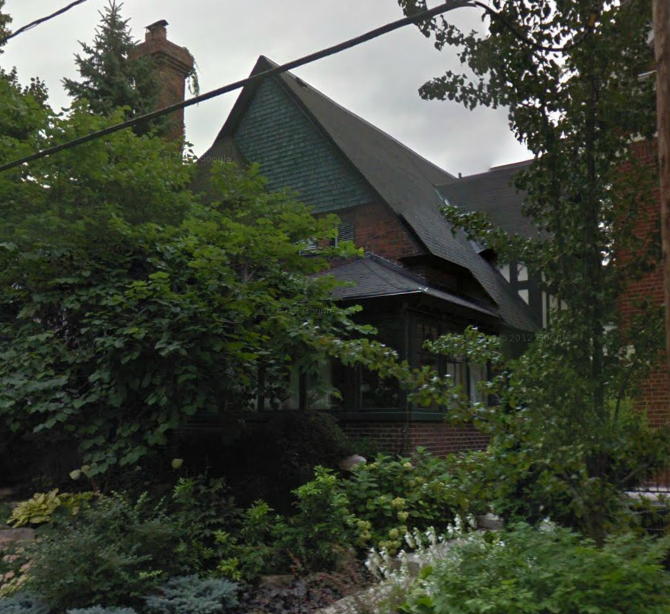 Meanwhile, Adam Vaughan’s vowed to destroy the OMB after Harbord Village residents were given permission to keep their illegal two-storey addition at the back of their 36 Brunswick Avenue home after an epic seven-year legal battle. Owner Shih Tseng, a former realtor, argued that he didn’t realize a permit was necessary. The battle cost Tseng about $300,000, the city $500,000. 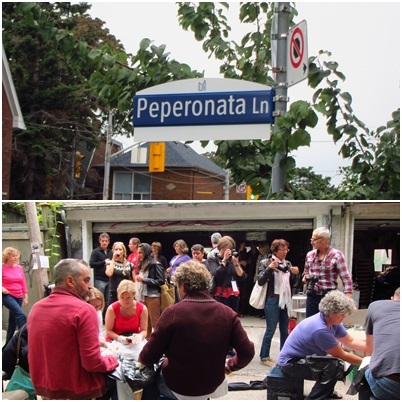 The Galle family’s annual peperonata-making party in the laneway between Montrose Avenue and Bickford Park was commemorated by the City by the naming of laneway on Saturday, September 14th. After the ceremony about 150 neighbours and friends sat down in the lane to roast, peel, and eat the traditional Sicilian pepper and potato dish. 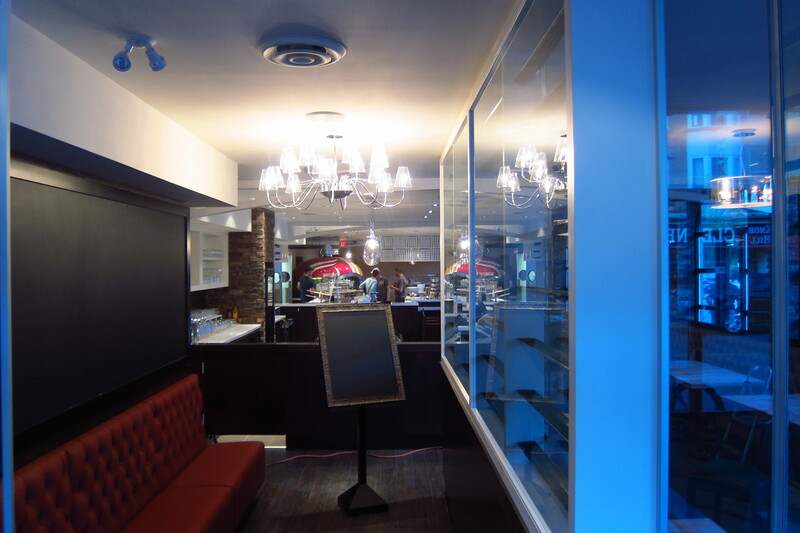 The thieves drove a white BMW in a daring robbery at the Prada Store at 131 Bloor Street West in the early morning of September 18, 2013. The store’s plate glass windows were smashed and purses and wallets taken. The Grid features an article this week about how apples from an Annex resident’s front yard ended up on the menu at Richmond Station restaurant with the help of Not Far From the Tree. 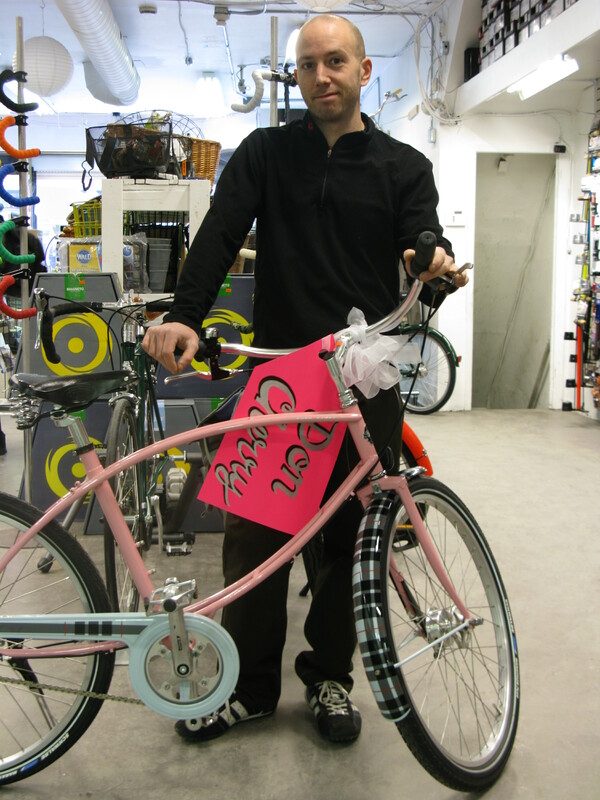 Saturday, September 21 at 1PM: Bagels for bike lanes: Love-in at the Harbord Bakery, 115 Harbord Street. Cycle Toronto has organized this friendly mass bagel-buy to show our good neighbour at the Harbord Bakery–long-time bike-lane opponents–that cyclists are an important part of their customer base. 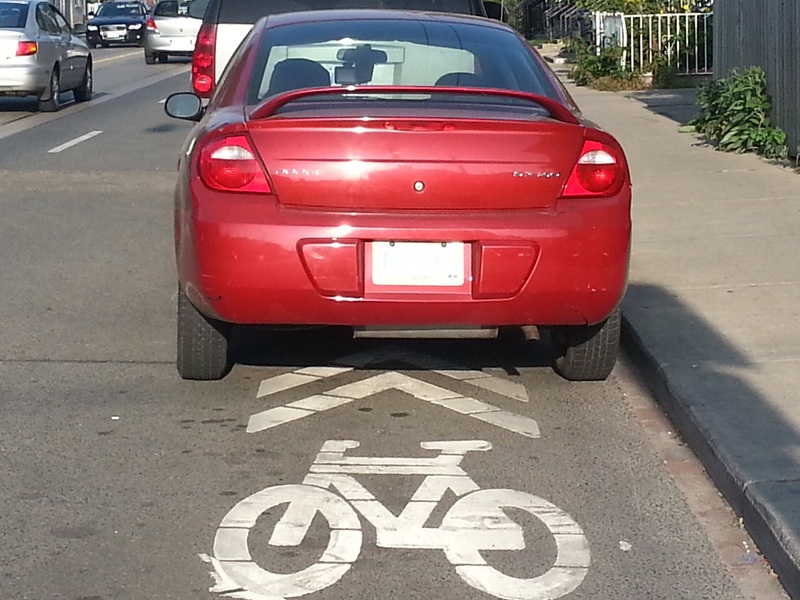 While you’re at it, don’t forget to sign Cycle Toronto’s petition supporting separated bike lanes on Harbord and Hoskins. 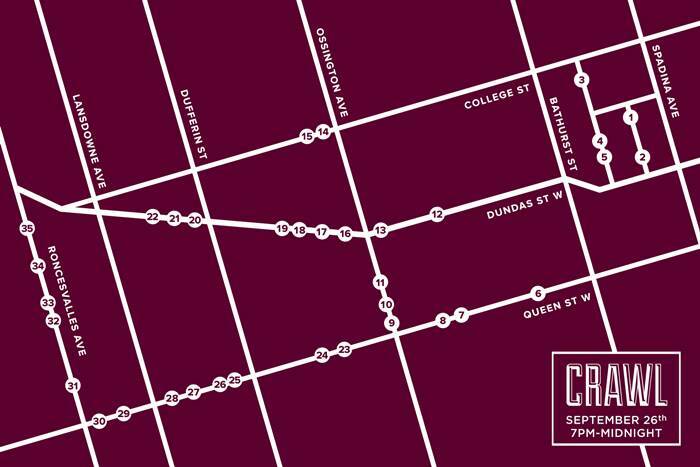 Saturday, September 21 and Sunday, September 22: Queen West Art Crawl featuring an outdoor art show and sale in Trinity-Bellwoods Park from 11AM to 6PM, a Parkdale Night Crawl, and guided art walks and talks. Thursday, September 26, 7PM to midnight: Vintage Crawl. More than 35 vendors between College and Queen, Spadina to Roncesvalles will offer vintage clothing, jewelry, furniture and home decor items. Anyone but Harper? Catch 22 and Project Democracy have tools to help you decide how to make your vote count. And since strategic voting can’t help stop Harper in Trinity-Spadina, consider signing up with VotePair.ca to swap your vote with someone willing to vote strategically in a riding where it can.